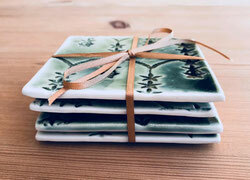 The main inspiration for these tile drinks coasters is from making something out of nothing as these are created using my recycled porcelain. I never throw any clay away but I am limited to what I can use this for as I don’t have a pug mill and wedge and prepare all my clay myself. 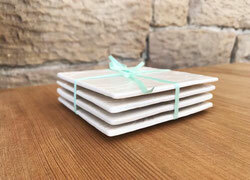 As the clay is simply rolled out and not formed into any other shapes it lends itself well to this. All the tiles are made using the same process of rolling out the clay by hand and impressing the surface with a textured fabric or lace. I have a large collection of different fabric and lace I have been collecting them over the years. In the past I have even been asked to impress a used wedding dress to create work from. 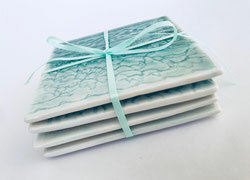 The hand rolled clay is cut with a tile cutter to get the same size each time. 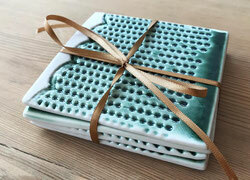 The lace is then impressed into the clay to create the desired texture and surface. I have selected and mixed my own glazes which then enhance the texture.